Our Shelters provides sealing off the gaps between a docked vehicle and the loading bay and are available to suit for your specific requirement. They are known for Durability, Long Life Span, Asthetic Design to protect the goods and environment. 3. Curtain Dock Shelters with Foam core. 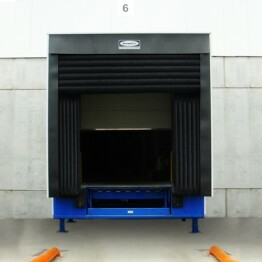 We supply and install Dock Shelters from Loading Systems ( The Netherlands) & DoorHan ( Europe Asia). Are you planning to extend your facility? And are you looking for a cost-efficient way of realising this extension? A dock house is an alternative that offers you, besides to fiscal advantages, many advantages. If your planning to extend your existing warehouse facility without making civil works, the Dock House is ideal solution to install. All dock products such as Dock Leveler & Dock Shelters can be incorporated in the dock house which can be designed to be leveled with exisiting warehouse floor elevation and insulated cladding for loading & unloading of the products. 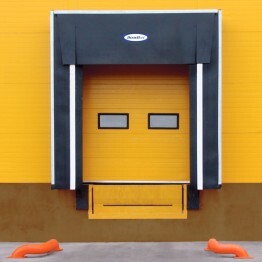 We offer Dock Houses from Doorhan ( Europe & Asia) & Loading Systems ( The Netherlands).